Half the battle for sustainability is usually won in the way a building sits in relation to the path of sunlight: How much of the building’s exterior surface directly faces east and west decides how hot the building and the spaces inside will get in summer. This L-shaped building is longer along the east-west direction, minimizing the wall surfaces exposed to the low-angle sun. The main living area of Lall’s own house is a “double-height" space topped by a glass roof under which is an expanse of quilted fabric that folds and unfolds to control the amount of sky the house opens to. Against the heat of summer, it is closed by day and the bits of mirror on its dark underside give the impression of a starry sky. In winter, it unfolds to let the sun wash over the interiors fully. Lall has ensured that the houses to the north of his plot, too, get a fair share of the winter sun, which his house would otherwise have blocked. Since he planned those houses as well, Lall increased their height and kept his own building slightly lower to let them get more sun than they would otherwise have. An important starting point for the design was the courtyard between the two connected houses, which provides a shaded space into which windows from both houses open without interfering with each other’s privacy. The courtyard, an important element in traditional architecture, gives the building an important gathering space between the two homes. Just after the house was built, this is where the extended Lall family assembled for the colourful and festive rituals that set off Holi celebrations, and it continues to be a space used separately as well as jointly by the two families. At all other times, the courtyard is a delightfully ambiguous space, neither crisply inside nor strictly outside the house. On wandering into it from the driveway, one suddenly glimpses the garden, with a lotus pond and a marble fountain, on the other side of the house. There is a passage from the brick-paved driveway through the courtyard into the rear garden, and this transition suddenly recreates many experiences that a traveller might have along the narrow lanes of desert towns in Rajasthan. Much of the meticulous detailing takes cues from Lall’s personal memories and that of the old house the new building has replaced. There is a little garland pattern in the terrazzo floor of bedrooms that one steps into. Or, the sightings of the moon through the glass roof of the atrium from the master bedroom. An iridescent tracery (ornamental stone openwork) of thin blue tile strips stretches across the ochre exterior and was designed to hide the variation in the texture of plaster panels applied on different days. The terrazzo flooring links to Lall’s childhood fascination for the floors of his parents’ home and to his early days in the profession (before the days of polished granite), when it was a finish that fascinated architects. The old house also yielded doors, windows and other woodwork, which were recycled in the new building. 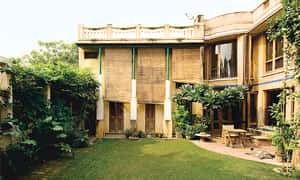 These infused an older texture and spirit of ornamentation into the contemporary design.The ochre of the external walls is not paint: It was achieved by heightening the natural sandy colour of Badarpur sand in the plaster with a yellow pigment.